Everything starts with an idea. We create and develop design focused events where these ideas can be generated, shared and explored. 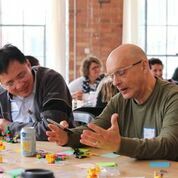 More than design, we provide expert event facilitation, source great speakers and deliver highly interactive and participative custom workshops using LEGO(r) SERIOUS PLAY(r).